PRICE: 1 hour (20 km guided tour) N$450.00 per person. 90 Minutes – N$550.00 per person. 2 hour (38-55 km’s guided tour) – N$650.00 per person. 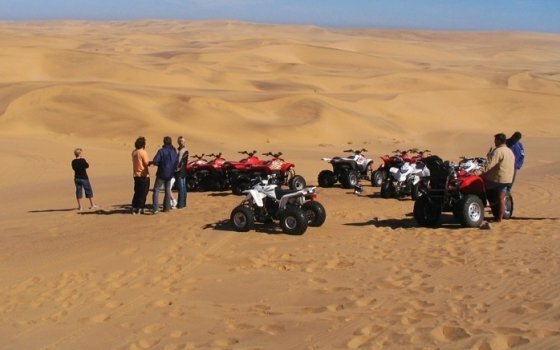 3 hour combo tour (Quad biking & sand boarding) – N$750.00 per person. 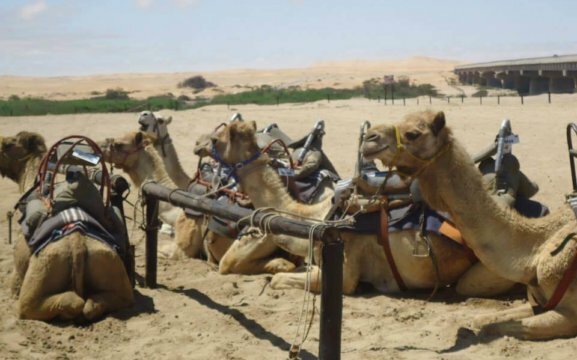 Camel Rides – 30 minutes – N$250.00 per person (children under 6 are half price). Activities for the whole family and adrenaline junkies. 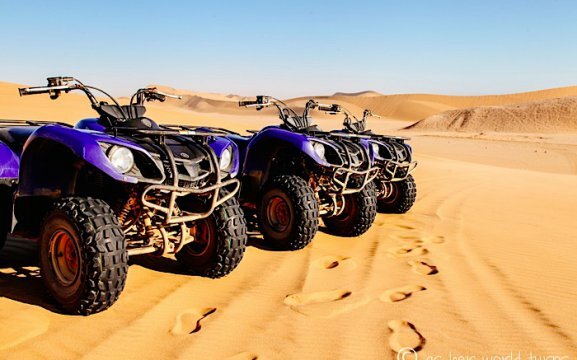 The Namib Desert and it’s gigantic ever shifting sand dunes offers the ideal venue for riding a quad bike. 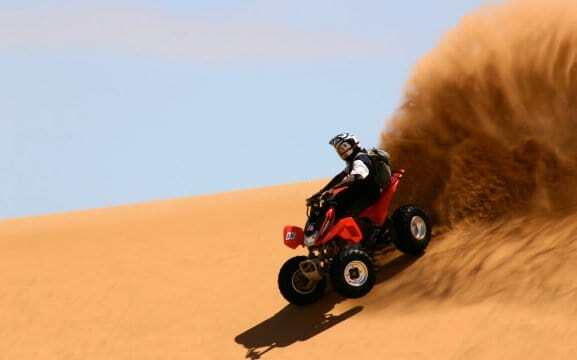 Get ready for lots of excitement and a rush of adrenaline as you climb some of the biggest dunes around. 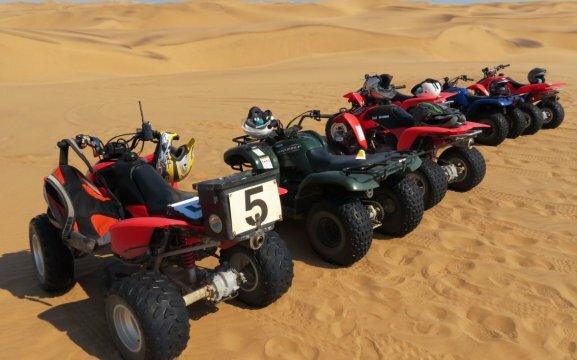 Desert Explorers offers quad bike touring with different routes and types of tours. We offer guided tours ranging from 1 to 3 hours. We also have the overnight tours from one night to six days. No previous experience needed. Our professional guides will make sure you experience the Namib Desert at first hand. 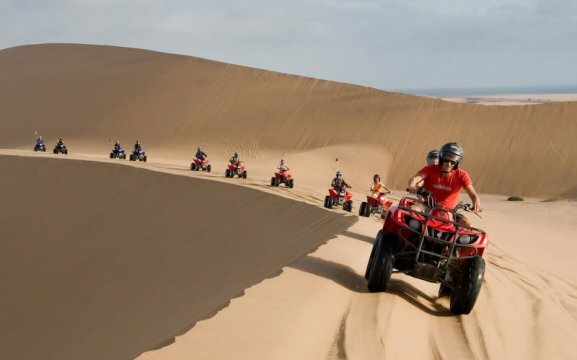 They will lead you through the Swakopmund River mouth into the dune belt. 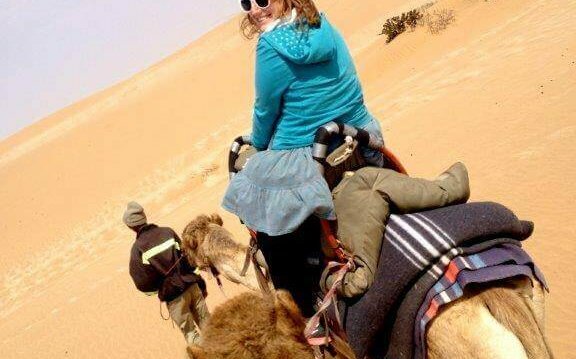 Our tours include the Amphitheatre, Roller Coasters, Big Billy and Devil’s Dip dunes. Desert Explorers is an eco-friendly company and will insist that participants ride in existing tracks to protect our dunes. 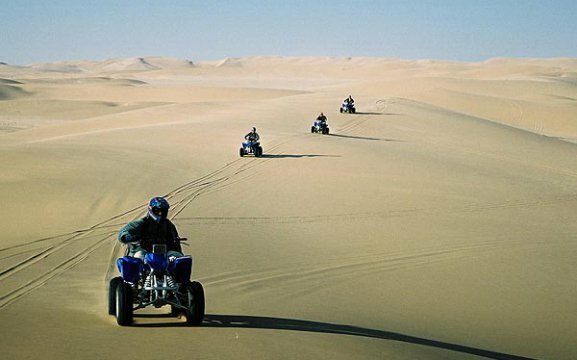 Throughout the ride you will enjoy spectacular views of the Namib Desert. Drinks and snacks from our kiosk on site. Tours include water, guides, safety gear and local transfers and loads of fun. There is no age restriction for quad biking. Children below 9 years old go free of charge. Above 9 years of age they pay half price as a passenger. If children take their own bike they pay full amount. 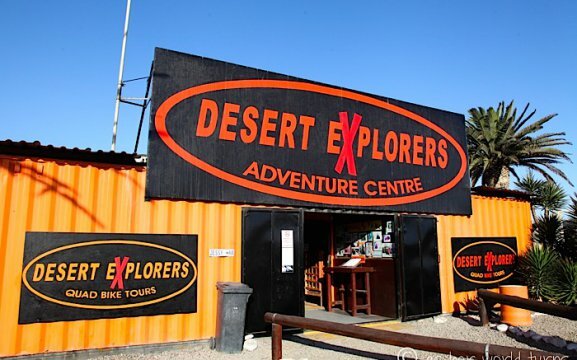 Desert Explorers also offer a booking service for many other activities in Swakopmund: Dolphin Cruise, Kayaking, Tandem Skydiving.